Well there is advertising and advertising. Asking multiple monitor manufacturers to supply sets of screens in order to test them for multi monitor setups, where the best sets will be used for a longer test period to see how they keep up over time, doesnt interfere with your journalistic integrity, bit for the manufacturers the cost can be written of as PR/advertising costs. in the end your readers will get the information they want, your integrety will be intact and we also will find out what the best monitors are for multi monitor setups. 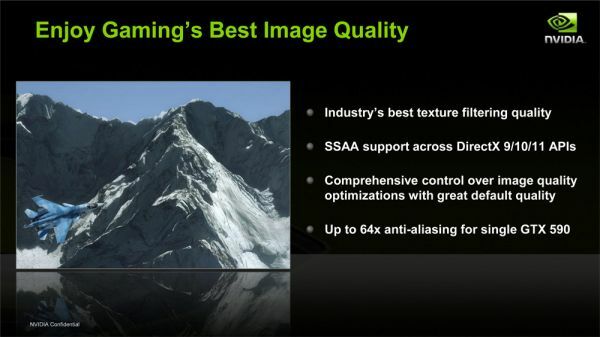 Once you are dealing with framerates above about 80fps at the highest resolutions and quality settings, multi-monitor is one option, or it is time to start cranking up the anti-aliasing as the results are otherwise irrelevant. I agree. Anandtech always seems to have a nvidia bias to their video card reviews. 100% agree. i own an AMD card too, and i felt like anandtech was extremely positive about the 5800 series when i bought that card. it also looks like they are leaning towards the 6990 vs the 590 in this very article. to paraphrase... the 6990 is going to be better for current new games and future games, but the 590 seems to do a bit better with older titles and new games played at lower resolutions. For the "hype" they were throwing out with that video preview, I thought they were going to pull a fast one and launch a GeForce 6-series. But a teaser video for a super-enthusiast GPU using existing tech that'll be so rare I'll probably never physically look at one in my lifetime? those 700 dollar cards are only to be bought by a rich few.